The Seven Wonders of the Ancient World, as defined by Philon of Byzance’s "Péri tôn hépta théamatôn" (About the seven wonders of the world) (7 wonders 1) were the largest and grandest works of architecture (known) at the time. These include the Great Pyramid of Giza, the Hanging Gardens of Babylon, the Temple of Artemis at Ephesus, the Statue of Zeus at Olympia, the Mausoleum at Halicarnassus, the Colossus of Rhodes, and the Lighthouse of Alexandria. The first wonder is the Great Pyramids of Giza. The pyramids are the oldest of the 7, and are also the only ones standing today. Built in ancient Egypt, the sandstone structures have lasted over 4500 years. The Pyramid Khufu, the tallest and most known, stands 450 feet high, and was the tallest structure in the world till the 19th century. There are estimated to be 2,300,000 blocks, each averaging 2 1/2 tons in weight (unmuseum 2). More interesting facts are that the sides are no more than 8 in. apart in length and the sides point perfectly to the points of the compass (also unmuseum 2). 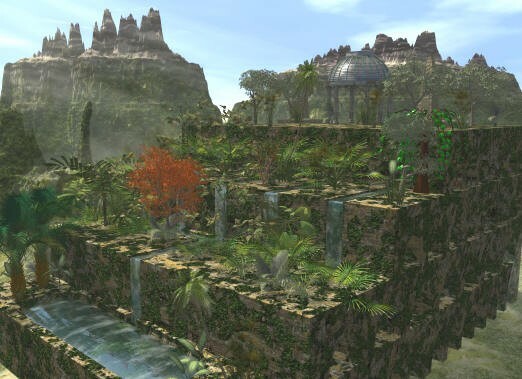 The Hanging Gardens of Babylon are the next great wonder. Standing at a shunning height of over 75 feet of brick terrace laid out in steps. According to History.com, “The king allegedly built the towering gardens to ease his lover Amytis’ homesickness for the natural beauty of her home in Media.” (History 7). The gardens were built in the city of Babylon around 600 B.C. and destroyed by earthquakes after the 2nd century. One problem in the idea of the gardens is the fact that Babylon received little rain, so water would need to be lifted to the terraces. The method of the way the Babylonians did this is widely debated from a form of a pump, water wheel, and cisterns, to a type of wheel and chain lifting buckets to the top. 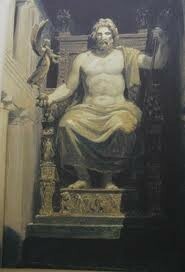 The Statue of Zeus at Olympia is the third great wonder. Built by the Greeks in honor of their king of gods, Zeus, this shrine was the centerpoint for the Olympic Games. “Standing” at over 40 feet tall, this statue of wood plated with ivory and gold was considered a sacred point in Greek history. This statue, however, burnt to the ground in the fire of 462. 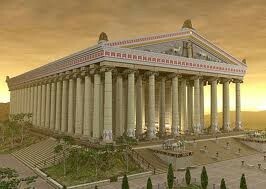 The Temple of Artemis at Ephesus is known as the 4th wonder of the ancient world. The Temple, or Temples (there being multiple), were among the most beautiful buildings in Ephesus. After the first few buildings burned down around 356 B.C., a new temple took form. History.com states “The new building was surrounded by marble steps that led to a more than 400-foot-long terrace. Inside stood 127 60-foot marble columns and a statue of Artemis.” (History 5). 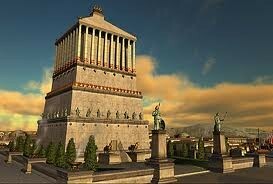 The Mausoleum at Halicarnassus, the 5th wonder, is the tomb of Mausole, the Turkish king of Carie, and his wife, Artemis. This beautiful work of architecture with 36 columns holding a pyramid decorated by a quadriga (a two wheel chariot pulled by four horses) (7 Wonders 6). It was devastated in an earthquake around the 14th century. Krystek, Lee. "The Seven Wonders of the Ancient World." The Seven Wonders of the Ancient World. N.p., n.d. Web. 30 Oct. 2012. <http://www.unmuseum.org/wonders.htm>. "Seven Wonders of the Ancient World." Wikipedia. Wikimedia Foundation, 29 Oct. 2012. Web. 30 Oct. 2012. <http://en.wikipedia.org/wiki/Seven_Wonders_of_the_Ancient_World>. Digital Digital image. Google Images, n.d. Web. 1 Nov. 2012. 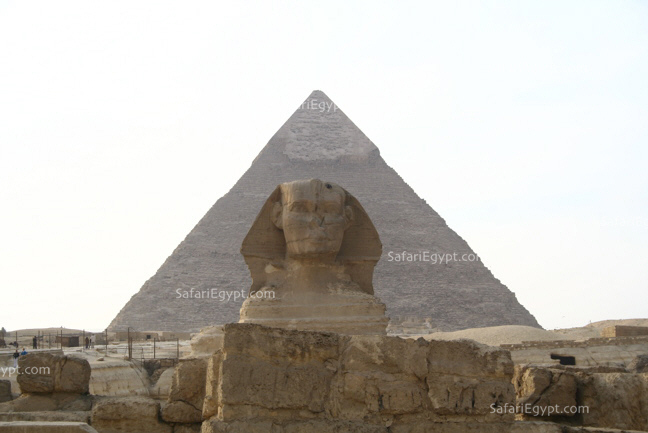 <Http://www.safariegypt.com/Information/important_sites/pyramids_giza/photos/IMG_7174.jpg.>. Digital image. Google Images, n.d. Web. 1 Nov. 2012. 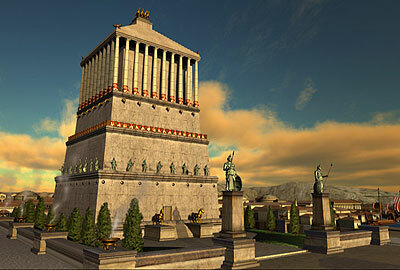 <http://www.kidsgen.com/wonders_of_the_world/new_images/mausoleum.jpg>.